I think my interest in small houses came from living in a small house when I was in my mid 30s. It wasn’t tiny, but it wasn’t what you’d call large e ither. By my guesstimate it had about 600 square feet. 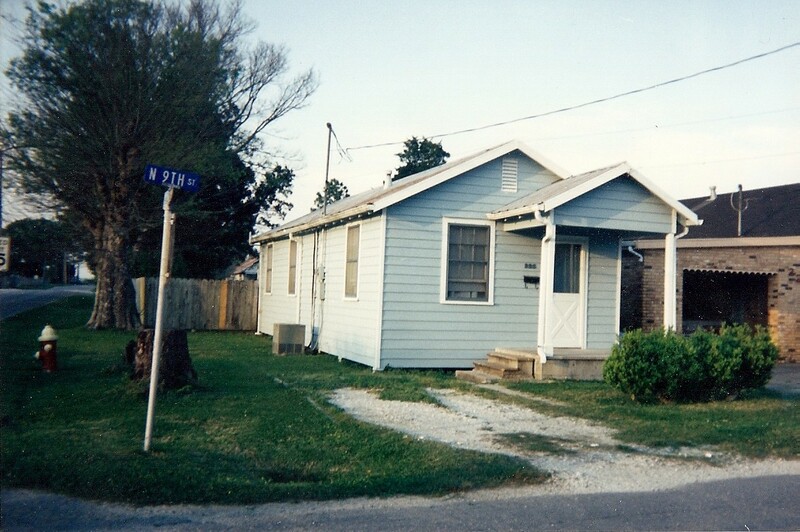 In Louisiana, we call this a “shotgun” house because you could fire a shotgun through the front door and the shot would exit the backdoor without hitting any thing. This particular house was built in the late 1920s or early 1930s. It was made of hand-hewn cypress and survived countless hurricanes. It had 3 rooms and a full bathroom. I paid $19,000 for it and wish I still owned it. My small house in the woods will be built using the same basic floorplan as this house. Only the front door will be in the middle of what is the side of this house. 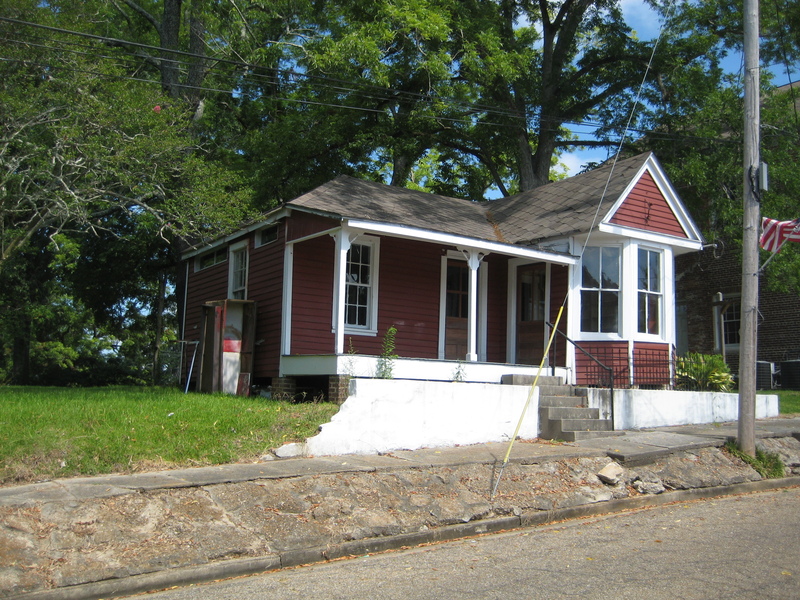 The bedroom in the front of this house will be extended and a porch will wrap around the house, sort of a mini Victorian similar to a house I saw in Woodville, Miss., pictured below. The Woodville house isn’t actually a house. It’s more than 100 years old and has been a store and law office. 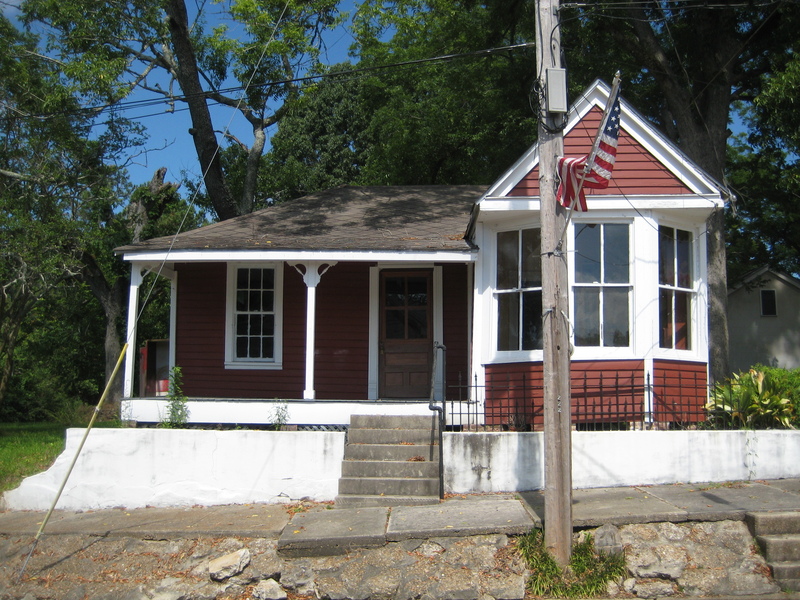 It is registered with the National Register of Historic Places. This picture was taken by a photographer with the Farm Security Administration in 1940, part of the effort to document the Great Depression. 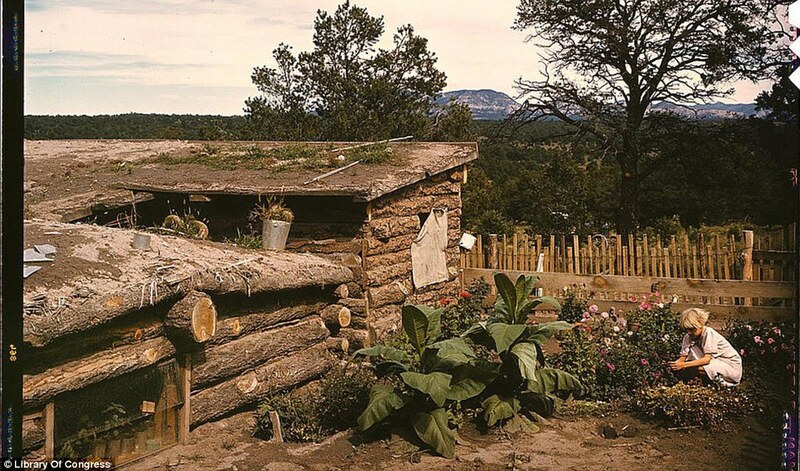 The picture shows the dugout home of homesteader Jack Whinery in Pie Town, New Mexico, in September 1940. Note the garden next to the home. While this was built in much more desperate times than ours, this would be a neat weekend place, especially with some solar panels and near a fishing hole. You can see more Library of Congress pictures from this period at this link. You can read more about what happened to the Whinery family at this blog. I haven’t posted lately because I’ve been preoccupied with life changes and I actually had a lot to do on my weekends the past month. From learning about fly fishing (I need to cast with my left hand because of carpal tunnel issues with my right) to celebrating my mom’s 80th birthday in Louisiana, I’ve been pretty much on the run. But I’m back in the rut again of sitting at home thanks to wet weekends getting in the way of camping and fishing, so I’ve started contemplating more ways to simplify my life. Cutting the grass has been on my mind, since I’ve been paying someone $100 a month to do it ($25 a week still ain’t bad). But with life changes come cash crunches, so I’m looking at taking on that chore again. Ever since I lived in Baton Rouge, which had frequent ozone alerts, I’ve been conscientious about my use of yard equipment. I had an electric trimmer, an electric blower and an electric chainsaw to lessen the amount of fumes emitted in the summer. There were no electric mowers back then. I still have the chainsaw, but the trimmer and blower didn’t make the transistion to married life in a new state. My wife insisted on using her gas powered tools and since she was the one using them, who could argue with that? Fast forward 11 years and I’m looking at handling those chores myself again. We have a gas mower but it’s not mine, needs work on it and, right now, I don’t want to touch anything that’s “hers.” So I’m looking at getting a new mower for the cost of about 2 months worth of lawn service fees. They have electric mowers now, but I haven’t been impressed with what I’ve seen. I don’t mind a corded model, but the ones I’ve seen in my budget range are made of plastic. One rock or tree branch and I’ll have to break out the duct tape. 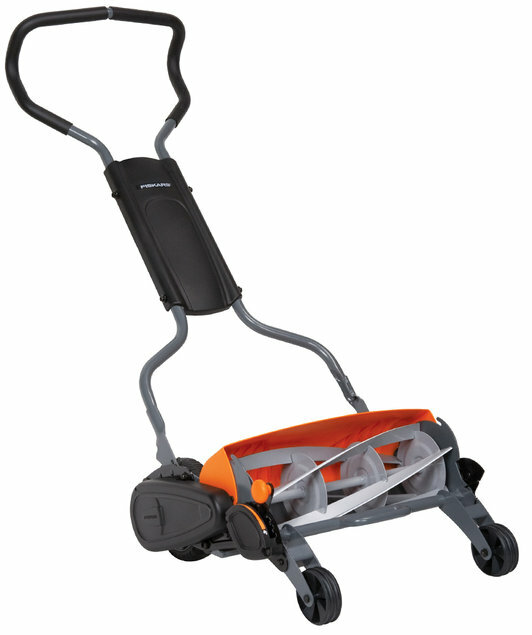 So I was thinking I’d have to get a gas mower anyway, until I saw a commercial on the Ion Life channel for Fiskars’ new reel mower. The Momentum looks like it has real potential. We had an old reel mower my dad salvaged from the dump when I was a kid. It was mostly for show, but I did cut the back yard with it once just to see if I could. The Momentum is pretty hi-tech and throws the clippings to the front, which means they get mulched. I went to Lowe’s today to look at one, but they didn’t have any floor models for me to try out. I’ll sleep on it for a few days and decide by Friday (payday) whether I want to get one or not. No $3.70 a gallon gas burned. No gas fumes in the air. No ear-aching noise. And I get a regular workout that would cost me $65 a month if I joined the Y, which I am also thinking about doing. Your ideas and thoughts are welcomed.